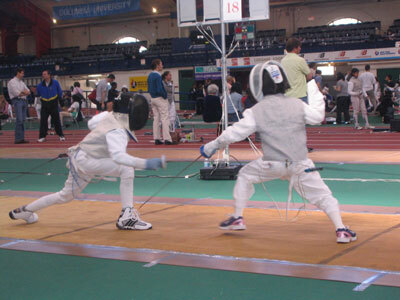 Yesterday, I wrote a post for the Washington Times titled “Athletes and parents: A parent’s guide to fencing tournaments.” Today, established Women’s Epee Fencer, Dr. Valerie Asher weights in with a thoughtful response on her own journey to learning how to be a good fencing parent. Dr. Asher is a member of the DC Fencers Club in Silver Spring, Maryland and a Division I Women’s Epee point holder. She is a ninja on the strip, and she WILL take you down. While you have made the point that the parent is not the coach, I think the parent has a vital role in helping a child learn to manage his or her emotions and behavior on and around the strip. Just as parents teach their children table manners, parents should be the first ones to teach their children to treat referees, coaches, and their fellow fencers with respect. When Nephew was small, before each tournament I would remind him that even if he wasn’t happy at the end of the bout, he should give his opponent a sincere handshake and acknowledge and thank the referee at the end of the pool. At the end of the day, if his coach is present I reminded him to thank his coach – even if he was disappointed with his performance. I also think that a parent who really knows the child is often the best one to help him/her learn to manage the emotions around losing – because very few fencers win everything along the way. Nephew’s first club tournament was marked by a spectacular outburst when he lost a bout he thought he could win; he saluted and then bolted for the men’s room without shaking hands and still wearing his mask. He did come back to the strip to shake hands – and then bolted out to the parking lot where he rolled on the asphalt in his new whites. An hour later he wanted to know if we were still going to the Capitol Clash. At that point, I decided we needed an emotional game plan. A few days later, away from the heat of competition, I explained to him that he and his coach could set competitive goals, but that he and I were going to set emotional goals. His first goal was to be able to finish a losing bout; behave well with the referee and his opponent; collect his gear; and leave the room. After he left the room he was allowed to vent in any way he felt he needed to. He thought this was a reasonable goal but asked that I set a small reward for making his goal; a post-tournament doughnut and one new game downloaded to my phone. We agreed; and once he met this goal, we set the next goal. He next had to learn to decompress by sitting for thirty minutes in the venue with his headphones on listening to music; followed by finding a teammate or friend who was still in the tournament and cheering for him. Now that he is in his early teens, the goals I set are about organization: keeping track of his equipment and paying attention to the posting of pools and the tableau so that he is at the strip on time. I’ve also had to learn to ask Nephew what he needs from me at a tournament. Most kids have very definite opinions about what they want from mom or dad. I try to listen to him and not let my own ego or opinions get in the way. Does he want me by the strip or out of sight? Am I allowed to cheer? if his coach isn’t there, am I allowed to coach? (the answer is usually no). His answers change tournament to tournament and year to year. At his behest, I always have plenty of water. When he’s doing well, he needs hydration to recharge his batteries; when he’s not doing well, drinking seems to calm him down. He also asks me to keep score and keep track of the bout order during the pool. While any scrap of paper will do to keep score, bout order can be found in the Fencing Journal sold by Absolute Fencing and is also available if you enter your child’s pool in the Fencing Ref app for iPad or iPhone. I have been interested to see that letting Nephew make mistakes can lead to insights that will ultimately make him a better competitor. In Louisville, he fenced a lackluster pool. When I tried to get him to eat before DE’s he refused, saying he didn’t feel hungry. I pressed a little but didn’t try to force him and ultimately he started the next round on an empty stomach. After an upset win in his first DE, he faced a more successful teammate. Just before he hooked up, he asked me if he could have some food after the DE. For the first two periods he had a strong lead. However in the third period I watched his his focus dribble away and he lost 14-15. Sitting next to me after the bout, he sounded puzzled when he said, “My concentration just disappeared.” And then a moment later, he said, “I think that I should have eaten when you wanted me to.” It’s much better for him to learn to manage his food and hydration during the tournament than for me to to manage everything for him. Lastly, I try to make our trips to NACs and Nationals include more than fencing. It is my hope that he will fence well and meet or exceed all his goals, but that is not a sure thing. Before his first NAC I told him that I couldn’t guarantee success; but that I can always guarantee that we will fun and will have at least one great meal with our friends. While some cities are more exciting destinations than others , I’ve yet to find a city that doesn’t have something worth trying, even if it’s just a barbecue joint or the best local doughnut shop. I do the research (or outsource it to his dad) ahead of time so I can manage our time well. At the end of any tournament, only a few kids will have gold medals. However I think that with some parental guidance, competition provides any child with an amazing opportunity to gain skills that will be useful well beyond childhood. And even when we have a disappointing day, I never forget that Nephew and I are lucky to be able to see a new city eat a great meal together. This is TheFencingCoach.com’s 4th guest post. I encourage any enthusiastic fencers to submit entries and I will post! One small correction- alas, as of this season I am no longer on the Div I points list. I would also like to make it clear that Nephew has two great parents. He has banned his mom from tournaments because she always feels bad when someone loses. His dad is an excellent Fencing Dad who sends Nephew to tournaments with his home-made beef jerky as a high protein snack. Valerie, great thoughts and great fencing parenting by you … in my humble opinion. With any luck i will soon be back in the fencing arena so perhaps I will meet you on the epee strip again. Absolutely no reason why a 14-year-old can’t track his pool bouts. Y-10ers can.